Press / News PMRA Racer, Bruce Boland heads for the top! 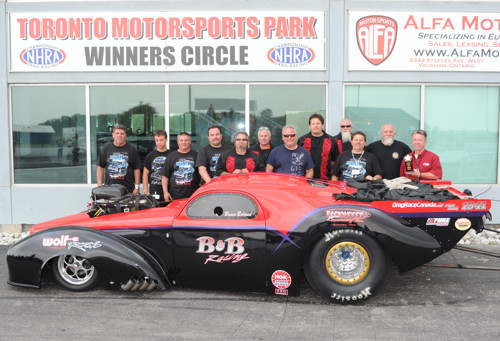 Bruce Boland of Hamilton, Ontario, returned to his winning ways, capturing the Pro Modified Racing Association race during the Canadian Nitro Nationals at the Cayuga Dragway of Toronto Motorsports Park. 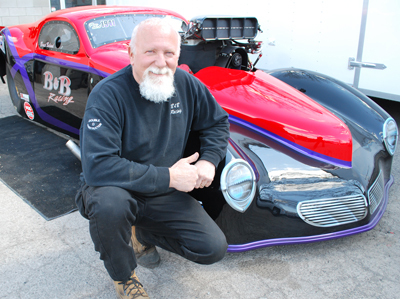 A three-time PMRA champion, this win was the first for Boland and his 1941 Willys Pro Modified in 2012. The win was also his series-leading tenth in PMRA competition since the series began racing in 2005. Boland qualified his Larson built Willys number one with a 6.005-second, 247.57 posting, and this was his fourth straight top qualifying effort in the PMRA. He met up with number three qualifier and former IHRA Pro Modified champion Kenny Lang of Grande Pointe, Manitoba in the final, but Lang had some handling issues with his 1969 Camaro in the race, and Boland drove down the track’s left lane to a 6.008, 237.71 victory. In first round action, Boland recorded the event’s only five-second run with a 5.931 eliminating number eight qualifier Jason Kalso of Clarkston, Michigan. In the semi-final, Boland got the jump on number five qualifier Eric Latino of Whitby, Ontario to advance.